Clearly the punk rocker of the animal kingdom. Or maybe that’s just my illustration; which turns a perfectly dignified animal into TOTAL SID VICIOUS BABY! Back up, having excellent defences, needing to protect yourself from yourself, having a tense or unusual relationship with trees, possessing an affinity with the darkness and the shadow realms, benefitting from primarily vegetarian diets, doing things your own way, being unique, look after yourself, don’t be afraid to inflict some damage, sometimes the nice way isn’t the best way, don’t be afraid to be prickly, watch salt consumption, learning to differentiate insult from fair statements, taking things slow will suit you right now. The North American Porcupine is a large tree-climbing rodent also known as the Canadian porcupine, common porcupine, and quillpig, among other names. They are found in Canada, Alaska and Northern/Western USA, where they are common and widespread. They are usually found in coniferous and mixed forests, but can also be found in deserts, shrublands and tundra provided there are adequate thicketed areas. They den in the holes of trees and rocks. Porcupines are known for their characteristic quills, which are modified hairs. They detach easily and are used as a defense, these quills are urticating and hard to remove. Because porcupines will sometimes get stuck with their own quills, they are one of the rare mammals to have antibiotics in their skin. The North American porcupine is solitary and primarily nocturnal. They are nearsighted, slow-moving, and selective, fussy eaters, which has lead to an unusually well-developed ability to negotiate mazes and memorise very complex directions. They are herbivorous, and in Summer they eat twigs, acorns, roots, stems and berries, in Winter they stay closer to their dens and eat conifer needles and tree phloem and cambium. Because they often focus feeding on a particular tree, they can kill it or cause extensive damage. They are sometimes considered a pest because of the damage they can inflict on trees, tyres and wood. Because of their slow movements, they are often hit by vehicles. They are predated upon by primarily by fishers, as well as wolverines, coyotes and mountain lions. 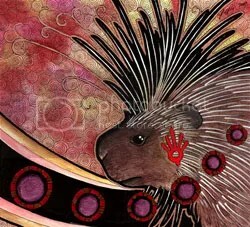 This entry was posted in animal totems, artwork, power animals, totem, totemism, totems, traditional artwork and tagged american porcupine, animal, animal totem, art, graphic design, north american porcupine, porcupine, porcupine totem, power animal, punk, religion, spirit guide, spirituality, totem, totem animal, totemism, totems, traditional art. Bookmark the permalink.